The AIM NetworkRossleighGood Guys, Bad Guys, Scott Morrison And Why Liberals Seem To Be Backing Failure! 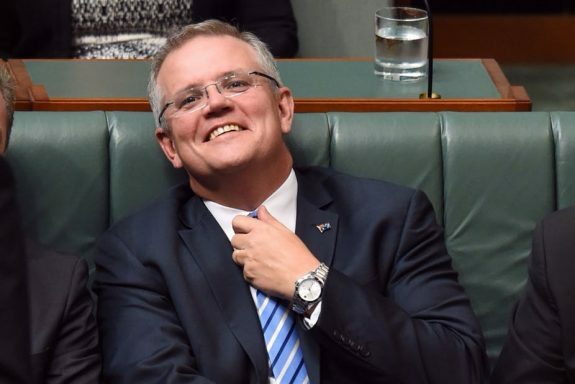 Good Guys, Bad Guys, Scott Morrison And Why Liberals Seem To Be Backing Failure! It’s noticed that a number of young people are getting into trouble after consuming alcohol. The city council announces that there’s no real problem; there’s always been underage drinkers and we can leave it to the police to deal with. However, after a lot of public outcry they appoint a special investigator. He questions a large number of people and discovers a racket where – not only are fake IDs rampart – but many of the hotels and clubs are helping kids to manufacture them. The police turn a blind eye to this because they have to drink at the hotels after work. Besides, some of them are hoping to get work as security in the hotels when they quit the force. Naturally, there’s a lot of public anger when this report is released and some are calling for the hotel owners to be prosecuted for breaking the law.The investigator hands his report to the city council with recommendations to ensure that this sort of behaviour is stopped. Yes, Scott Morrison’s initial response to the banking Royal Commission didn’t exactly fill me with confidence. While I have heard the phrase, “you don’t need a sledgehammer to crack a nut”, I suspect that we may need more than a nutcracker to change the culture of the financial institutions. We certainly need a government who sees it as a problem and not one which seems to have the attitude that, well, they were only trying to make money and surely that’s what everyone should be doing. I mean, they were having a go and doesn’t that mean that they should get a go? Surely white collar crime comes with a “Get out of jail free” card? If you replace the crimes of financial institutions with importing heroin, prostitution or people smuggling, you’ll, of course, get a completely different reaction from the Liberals in terms of the desirability of having a go. “Having a go” is only a good thing when it’s a Liberal backer who’s doing it. Perhaps my suggestion that Liberals are putting all their money on Labor and running dead isn’t completely silly. After all, if you think about the assertions that we’ll be headed for a recession if Labor are elected is a pretty effective potential “I told you so”, in the event of a Labor victory. Generally, our recessions have been caused by overseas conditions, so if China and the USA’s trade war reduces demand world-wide, we could have trouble in Australia. Labor will have trouble explaining that it’s really nothing to do with them, after all the Liberal warnings. On the other hand, if by some miracle the Liberals were returned, how would they explain that the recession was – in fact – still Labor’s fault. Ok, they’d certainly try to argue that… Let’s remember that Labor were to blame for the oil shocks of the seventies, world-wide inflation in the eighties and the GFC. No, didn’t say “responsible for”, I said “to blame for”. Just as the current dip in house prices is all the result of a policy that hasn’t even been implemented yet. Whatever, it seems that good guys and bad guys make up a large part of the Liberal narrative. It’s not just that we have a difference of opinion or a different world view. People who don’t have a go are bad, people who break the law are bad (but only if they’re part of something like an “African gang”; organised crime figures can run fund-raisers without there being a problem) and, of course, Labor and Greens are bad. Bankers, on the other hand, are “having a go” and if that encourages them to occasionally overstep the mark, well, that’s why we have bodies to tell them that they should stop and will tell them again if the first time wasn’t enough. Of course, if they still don’t stop, the regulatory bodies have, on a number of occasions, asked the banks what sort of fine do they think it would be fair for them to pay, so we don’t have to go through all the rigmarole of going to court. Yep, it’s not just a difference in whether you’re a lawbreaker or not that makes you a bad guy in Coalition eyes. And it’s not just a difference in what sort of crime it is; stealing a loaf of bread is evil, but stealing water is understandable. It’s who you are that counts most and, if you wear a suit, why, you must be having a go and we need to be very, very careful about criticising you, because I may have been photographed shaking your hand too many times and trying to tell the public that I’ve washed my hands since, just won’t cut it! Stealing water is only understandable if you are a greedy broad acre farmer in SW Qld or NW NSW who does not give a fig for any other agricultural enterprise or regional community in the MDB. I’ll bet the cotton farmer mafia donate lots of money to the coalition especially that reprobate Barnaby, who was seen crowing and celebrating how he had managed to ensure that the farmers got their extra share of water and nothing to the environment. He was seen whooping and jumping up and down in the pub with those same crooked greedy farmers. And now the NSW government and the lovely Gladys Berejiklian have rejected outright, the finding of the Royal Commission into the Murray water planning board. These coalition politicians are the worst bunch of economic and environmental bastards we will ever see for a long time. And Gladys is just as bad as that rotten Barnaby Joyce. An excellent,concise piece as ever R.
One cannot steal a loaf of bread,but an entire continent…AUSTRALYA DAY!! Genocide to follow,as usual. As for the despotic,extreme right wing LNP regime,I think me and you are on the same page.They certainly do seem to be running dead because the writing’s on the wall as far as capitalism is concerned and things don’t look great at a global level. To strangle a Chinese proverb..
Help other people,happy for life. We’re in this together people,and we need to help each other,on a global level. Henry, let’s not forgot Mike Baird who sold NSW infrastructure to foreign corporations, and Sydney and Newcastle to the developers. When you stole a loaf of bread in them olden days in England, you nicked something that somebody had hand-made, it was his or her bread. If you stole it you were a criminal and you were sent to Australia…. When it comes to water, we know it belongs to god in the heaven and because at times it’s too hard to keep it in them clouds, god lets it run down. According to the ancient laws (maybe Greek ?) the finders are the keepers, and therefore if the cotton farmers saw the water first, they can keep it…. Why any sane rational politically astute person would vote for the Libs or the Nats is beyond my comprehension! Maybe i have just answered my own question. In C. J. Dennis’ “Glugs of Gosh” (published 100 years ago & recommended reading), a cross-eyed man complains about government policy and finishes up in court. “Yep, it’s not just a difference in whether you’re a lawbreaker or not that makes you a bad guy in Coalition eyes. And it’s not just a difference in what sort of crime it is; stealing a loaf of bread is evil, but stealing water is understandable. It’s who you are that counts most …”. Fleeing persecution or war as a refugee on a boat is evil – similar punishment to those stealing a loaf of bread – banished to some penal colony hell-hole. Please, satirists and comedians, write and act out your scripts using this information, as it is ready made for you. Perhaps don’t charge much, so that many will come and listen. Or do your acts on commercial TV – no, they won’t let you- but you get the idea. This is the time for satirists. Where are you, the reborn Voltaire, Swift, Moliere? Fairfax is flooding us with fluff pieces about Morrison today. Nothing on Shorten. Are they setting the scene for the next few months? As a relatively new migrant, I have to wonder sometimes how much the convict background of the foundation population of Australia has affected the Australian psyche. After all – how many enquiries have there been into corruption in the police forces – into those who should be ensuring we all uphold the law? Forget the banks, forget terrorism, forget our borders, forget franking credits, the government must take a stand and stop these people before they change people’s vote by talking to them!! Why don’t the right wing organise their followers to do the same? They have that option. Of course, Florence, that’s an entirely different thing. @John O’Callaghan: The answer to your question probably lies in this survey from the New England electorate. being naive country bumpkins New England voters reject the incursion of all “outside” influences and flock together in a defensive strategy. “Better the devil you know because he is local” and an Adulterous Alcoholic. Like children, infatuated with their own cleverness, yet such fragile egos. Up to their necks in corruption…absolute false consciousness. Florence, in answer to your question, they cannot find enough right wingers to give up their precious time to keep Dutton in parliament. Adrienne H I haven’t forgotten that snotty nosed dickhead Baird, who’s now esconced in the NAB building on George Street smirking and sneering while he revels in his upwardly mobile move into the world of banking crooks where,to be realistic, he belongs. Maybe, just maybe, he walks into one of the open construction holes on George Street and maybe that wipes the smirk off his face. Michael Taylor…………. Fairfax is now owned by Ch 9, whose Chairman/CEO is none other than that slimy gutless coward, Peter Costello. Not to hard to join the dots is it ? There is no independent media outlet left in Australia. no independent media outlet left in Australia. Really? Is this site just fake news whose masthead is completely misleading? LOL. Personally, I hope the rats get him. Read this and keep your fingers crossed. Simple slogans that require complex explanations rule. labor will undo all the good we have done remember howard’s profit. Bill is neither seen nor heard and never get a mentioned other than ‘a grinning idiot’. Bill cannot dance, follow the diludbransimkims and his team must have the story thoroughly learned no slip ups. Where can I get some of that stuff, wam? I always tick the “Notify me of follow-up comments by email” box when I make a comment. It could be my computer settings but I notice you have, occasionally, hinted at “trouble at the works” at WordPress. Unless you are referring to my tablets etc. Thankyou, I haven’t laughed so much in years. Cynthia, you are too kind; if we don’t laugh, we’ll be crying… in these tough times, humour is a life-saver.. This character should be banned from running…ah, what’s the use, he’s LNP. Jesus H. Christ on a bicycle! Then again, I think (we can hope) his chances of getting in are about slim to tough luck. All is suppression, Kaye Lee...all is suppression.